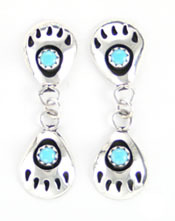 Sterling silver double shadow box mini bearpaw dangle earring with two 3mm or free from turquoise stones. It measures approximately 1 1/4" long and 7/16" wide at widest point. Navajo crafted by Gaynell Parker. Color shade of turquoise will vary.